I don't think I'm wrong by guessing, for my generation – not the age but when he/she has started Atlantic Salmon Flies = 21st century – those four books by Mike Radencich could be the first textbook to own and there would be people who wouldn't consider getting more instruction books. I, for one, did learn a lot from these books. Along with tutoring from my mentor, I started learning "modern" methods. Then when we do look back at historical figures and events, it goes all the way back to late 19th to early 20th centuries (Mr. Kelson, Dr. Pryce-Tannatt, and so on). Isn't there anybody in between who passed the traditions to our "modern teachers"? Poul Jorgensen is the one. 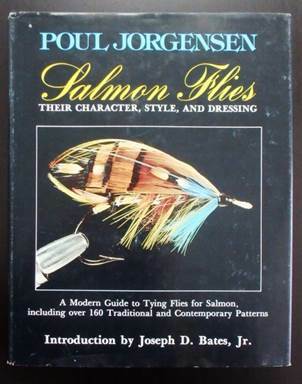 Indeed, several dressers in Atlantic Salmon Flies: Tyers and Their Art (Judith Dunham, 1991 = Review 3 of mine) mention how Jorgensen and his book initiated them. This (Stackpole Books, ISBN: 0-8117-1426-8) is a very concise work, even for the 21st century standard. It must definitely have been "modern" back then as otherwise textbooks available would have been those from late 19th to early 20th centuries. Certainly it was way before the age of the Internet! Anyways, this will definitely serve as a textbook for 21st century students, from beginners to those with some experience or for a tying class. Borrowing words by Joseph D. Bates, Jr from his foreword for the book, "Poul is the greatest, but I can say that he is the most versatile". Indeed, he covers not only "classics" (mostly display purposes) but also hair-wing, dry-flies, nymphs, prawn patterns, and tube-flies for actual fishing. Then as most of us know, he's a well-accomplished trout fly tyer as well. This book can be found at used book markets (store or online) relatively easily. I just wish there were more color photos. That being said, I have browsed the 2nd edition in which the same contents are revived in color. This is out of scope for this review as I don't own it in my little library. But surely I know, and most of you will soon find out with our online technology, that the 2nd edition is highly prized.